When you want to add a touch of class to the kitchen in your home, you cannot go wrong with new granite kitchen countertops. Whether you are upgrading the current counters in your kitchen or you need a granite countertop installer to help you finish your new construction project, we have the right solutions for your specific situation. When it comes to granite countertops, the experienced and knowledgeable staff at our flooring and home improvement superstore is ready to help. We are more than happy to answer any questions you might have about the styles and brands of granite countertops we have to offer you. One visit to our store is all it takes to become a customer for life. We have aisles and displays filled with examples of our granite kitchen countertops for you to sample in a real-world setting. You can visualize the countertops for yourself to see if they would match well with your personal style and tastes. Feel free to bring in pictures and color samples from your kitchen to make sure that we can assist you in matching the perfect granite color and style to your interior home décor. Rely on our skilled and experienced team to install the granite kitchen countertops in your home. We have many satisfied customers throughout the area and can provide recommendations upon request. Let us help you upgrade your home and be thrilled with the way your kitchen gathering place looks. Easy to clean with warm water and a mild soap, these countertops are perfect for homeowners who want to enjoy a beautiful countertop without having to spend much time on cleaning and maintenance. Along with being easy to clean, granite countertops are also strong and durable, lasting for decades. Because granite stone is formed by heat and pressure, you can rest assured that hot skillets and frying pans won’t damage your countertop. In addition, these sanitary countertops are resistant to fire and bacterial contamination and they never depreciate in value. Once you have chosen your favorite countertop and spoken with our design team to set up your custom countertops, we will schedule you for our efficient granite countertop installation services. Because we know how important your time is to you, we work around your busy schedule when we begin to install your new kitchen countertops. We pride ourselves on how quickly and efficiently we perform our granite countertop installation services. The skilled and experienced team that we send to your home works diligently to make sure we have as little an impact on your home routine as possible. We guarantee you will be thrilled at how amazing your kitchen will look and function once we are done installing your new granite kitchen countertops. With every job that we complete, we make sure to leave the site cleaner than we arrived so you can enjoy your amazing new kitchen immediately with no need for cleanup. For your convenience, we even haul away your old countertops and any fixtures that we replace. 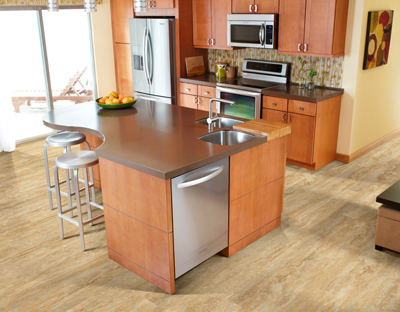 Contact our flooring store today for more information about our granite countertops. We sell and install granite countertops for customers in Prattville, Alabama and surrounding areas.